Delicata squash are considered a winter squash because they ripen in the late summer and fall seasons. However, unlike other winter squash, like an acorn and spaghetti squash, the skin of a delicata squash is easily sliced. The skin is edible after roasting or baking, so peeling is not required! Delicata squash have a slightly sweet and nutty flavor, and a soft, creamy texture. They are also fairy low in carbohydrate — a 1 cup serving has around 10 grams of carbohydrate. A popular Paleo, snack-friendly way to eat delicata squash is to create “fries” from delicata squash by halving and chopping into bite-sized pieces, coating with olive oil, salt and pepper, then roasting in the oven at 400 degrees for 20-30 minutes. Orange dots show how 1 cup of delicata squash fits into the typical nutrient profile of a Paleo meal. PURCHASE: Select a delicata squash that is firm and does not have any soft spots or wrinkled skin. A ripe delicata will be pale yellow in color with green stripes. SEASON: Delicata are best found in late summer and early fall. 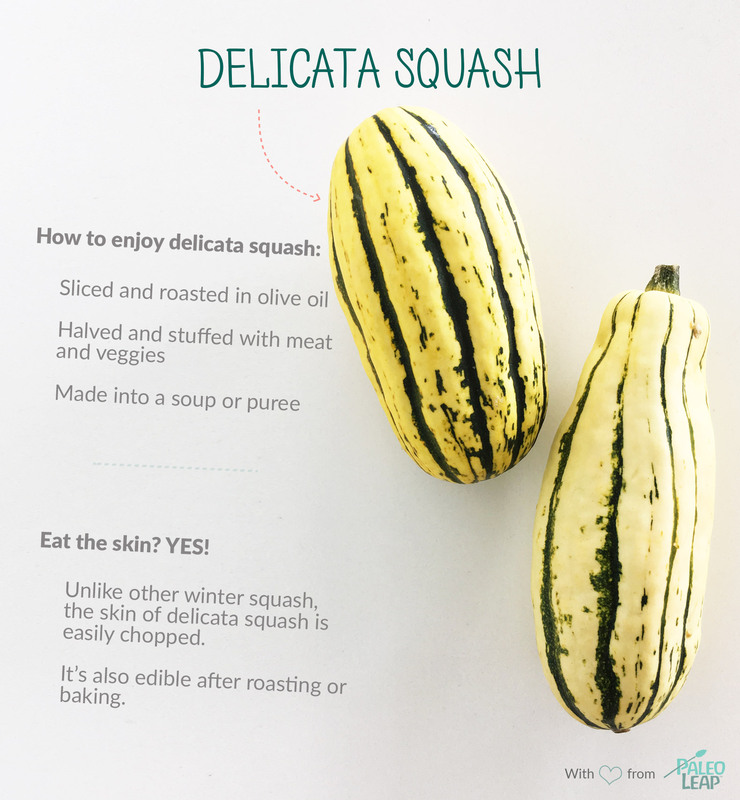 SKIN: Unlike other winter squash like butternut and spaghetti squash, delicata squash has a soft skin and are easily sliced with a knife. After roasting, the skin is soft enough to eat. No peeling required! Slice the squash into 1/2-inch rounds and scoops out the seeds. Coat in olive oil, cinnamon and nutmeg and bake for about 30 minutes at 400 degrees, flipping halfway. Serve as a side or top a salad. Oven-roast the delicata squash, scoop out the flesh, then use as a base for a soup or puree. Halve and chop the delicata into bite-sized fries, coat in olive oil, salt and pepper and roast in the oven. Halve the delicata squash, stuff with meat and vegetables and roast in the oven.